Samsung just unveiled the Galaxy Note 8.0, but they won't be satisfied until there's no stone unturned for Mobile World Congress. 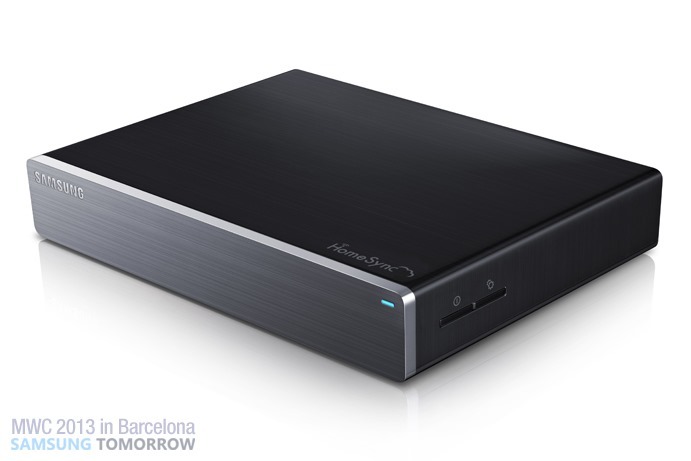 In a disappointingly dry press release the company debuted the Samsung HomeSync, an Android-powered set top box that combines Google TV features and a home media server. Major bullet points include a full terabyte of storage, WiFi and Ethernet access, and an interface powered by Jelly Bean (presumably 4.1) with full access to the Google Play Store. Based on the language in Sammy's press release, that's the full Play Store, not the comparatively measly selection of apps available to Google TV units. The possibilities for that are intriguing, maybe even more so than devices like the OUYA. Hardware power comes from a 1.7Ghz dual-core processor of unknown origin, 1GB of memory, an additional 8GB of flash storage, and support for all the standard video and audio codecs. Connections come in WiFi, Bluetooth, and MicroUSB flavors, with the only video option being 1080p HDMI with support for HDCP. USB 3.0 and optical-out audio round out the package. Unfortunately, Samsung didn't provide a look at the TV interface for HomeSync, though I'd bet it looks pretty similar to their current range of Smart TVs. The device will start a global rollout in April 2013, with an undisclosed price.